Connaissez-vous Le Wirtland? Mais oui! The French Wikipedia has now started an article on Wirtland. French has become the 7th language in which Wikipedia articles on Wirtland are available. Wikipedia's coverage of Wirtland is growing steadily. The first article on Wirtland appeared in Bulgarian Wiki, soon followed by English, Spanish, Russian and other language versions. "View from Wirtland" is a new project of our team. While "The Times of Wirtland" is mostly restricted to the Wirtland's internal news, View from Wirtland is "facing outside". 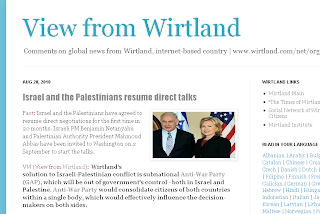 It is a blog exclusively focused on the global news feed, providing brief comments on current international events, with emphasis on the Wirtland's official position on each topic. Madonna congratulated Wirtland with its second anniversary. 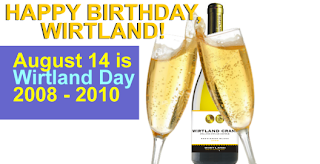 The pop icon's message reads "Happy Birthday, Wirtland! Greetings from La Isla Bonita!". We wish to thank Madonna for her greetings and congratulate on her own birthday, which was just two days ago. Thank you, Madonna. You are always welcome in our country at Wirtland.com/ Wirtland.net! To be on the safer side, Wirtland PR department contacted Madonna's official representation to verify if the congratulation in fact came from the pop superstar. Happy Wirtland Day! Please accept my best wishes for happiness, good health, successful and prosperous life within our world-wide internet community. Wirtland is two years old. Not much for a country. But a lot for a micronation. 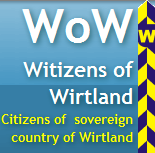 Starting from zero in 2008, Wirtland became the world’s largest micronation. We are happy to welcome new citizens almost daily. They come from every country of the world. Wirtland’s plastic ID cards are being used for identification by people on all five continents. Our Citizenship Application Form is now available in 12 languages (English, Spanish, Bulgarian, Turkish, Portuguese, Russian, Thai, Korean, Dutch, Italian, Chinese, Japanese), and all translations have been done by our citizens. It’s not a big exaggeration to say that Wirtland is everywhere. Like any new project, we had our ups and downs. Our gold and silver coins have been a fantastic success, instantly making Wirtland the world’s only micronation to produce such objects. But direct retail sales of coins became too expensive for the mint, because sending precious metals to many countries is restricted. That’s why the coins are now available only from re-sellers. Our mint is ready to produce the coins in bulk. We still need to find the way to distribute them. Wirtland ID cards are becoming popular. The orders have come from a wide range of countries – from Canada to Turkey. Obviously, the witizens find ways to make them useful for real life purposes, for instance to use along with a credit card, or to prove one’s age. Though we had to increase the card issuance fee in accordance with our printshop’s pricelist, the demand for the cards remains stable. In future, we want to make the cards much more useful. As IDs have names and unique numbers, they can be used as discount cards. We are seeking merchants willing to accept them, offering discount to citizens and attracting new clients. One of more serious landmarks of Wirtland’s history was development of our plan for real land acquisition. This plan is a barter deal between Wirtland and a recognized country. According to it, Wirtland helps such a country to make financial profit out of its unused territory, in exchange for a transfer of symbolic piece of land to us. Fantastic as it sounds, this plan has nothing impossible about it. Of course, we are realists and did not expect success after one or two attempts. We will continue to carefully identify potential partner countries and work to establish contact with them. One of our top priorities, if not the highest one, is raising awareness about Wirtland in the world. In accomplishing this aim, the first year of Wirtland was very successful, with dozens of articles and two television shows: on America’s FOX Channel, and on Bulgaria’s main BTV Channel. I have to admit that the second year was less bright. One of the reasons was, probably, the painful exodus from our hosting provider, caused by change in its pricing policy. However, a large part of responsibility remains on Wirtland’s administration, and personally on me. In the future I will take more active part in the popularization of Wirtland. Also, I want to facilitate contact with the citizens and the press, and establish a direct questions-and-answers hotline with my office. At the same time, I strongly believe that citizens of Wirtland also need to play a more active role in spreading the word about our project. Economic sustainability of Wirtland is another core priority. Many ideas have been proposed, but no considerable business projects have been realized or even developed so far. I believe this is natural. The number of our population is still very low, while for business projects we need highly experienced professionals. But they are too few, and in high demand – even in the big countries. So, we do not dramatize the lack of business activity, but we want to encourage more initiative in the business field. One of promising directions is the “Wirtland Franchise” model, which serves a dual purpose: profit generation and popularization of Wirtland. 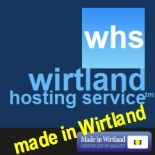 “Wirtland Franchise” is, essentially, use of word Wirtland as a part of brand name for various new products. This model was first proposed by a South African winemaker, who wanted to sell wine under Wirtland label (“real wine from virtual land”). The same approach may apply to a variety of products and services, and we hope it will prove successful eventually. 2010 was also marked by establishment of Wirtland Institute. Wirtland Institite (WI) and Global Antiwar Party (GAP) are two Wirtland’s pilot projects in the humanitarian field. They are conceived to demonstrate Wirtland’s stand in the theory of statehood (WI) and in the practice of political life (GAP). Of course, they are still in embryonic phase, just like Wirtland itself. But we believe they serve as an important message, that Wirtland is more than just another online game or business venture, and has ambitious goals in politics and policy as well. After this overview, let briefly touch upon our new initiative - Witizen Services. Wirtland’s overall concept is simple. We want to build the country around the person. We are not starting with institutions, laws and other mechanisms. We want to address person’s needs, first and foremost. This is why we are now developing Witizen Services. First, we want to learn what services are most needed by the people. Second, we will define what services Wirtland can render, taking into account our natural limitations as non-recognized country. We will hire qualified personnel and start rendering the services. The personnel will receive salary. The salary will be formed from the service fees. What services will that be? Let witizens decide. It will depend on the people’s demands, and Wirtland’s ability to find appropriate professionals. From legal services to consulting, from information and translation services to security, from medical to religious. As witizens come from every professional sphere, our range may be rather broad. Among the most obvious services that Wirtland should offer to our citizens is protection and legal advice. If you believe that you are in trouble and need legal support, perhaps contacting Wirtland’s lawyer would be a good idea. If you feel you were offended, maybe Wirtland can protect you. There is a chance that a witizen, who is willing and able to help, is nearby. We just need more information to release the full potential of witizenship. That’s why we are starting Witizen Services and looking forward to hearing from you! 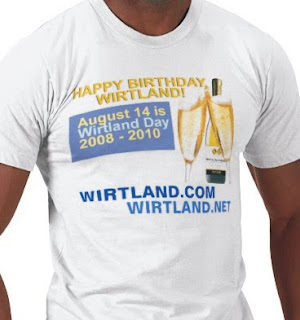 On August 14 Wirtland celebrates its second birthday, a national holiday. Chancellor Alexander's Statement reads: "... Wirtland is now two years old. Not much for a country. But a lot for a micronation. Starting from zero in 2008, Wirtland became the world’s largest micronation. We are happy to welcome new citizens almost daily. They come from every country of the world. Wirtland’s plastic ID cards are being used for identification by people on all five continents. It’s not an exaggeration to say that Wirtland is everywhere. (full text here)." We will be adding special anniversary news to this post. In the meantime, here is a small gift to Wirtland's citizens and friends: official Wirtland Anthem Ringtone for mobile phones. This jazzy tune is less formal than any ordinary anthem - relaxed and easy just like Wirtland itself as compared to traditional countries! 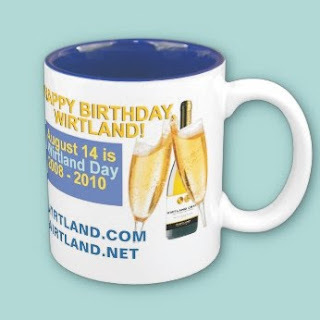 We have also prepared some Special Anniversary Edition souvenirs for Wirtland fans: T-shirts, mugs, etc. Tell us if you like them or want something new. Check back for more Anniversary merchandise and souvenirs here.